Sause Bros. has grown into one of the most respected names in marine cargo transportation since it was founded in Coos Bay, Ore., in the 1930’s. 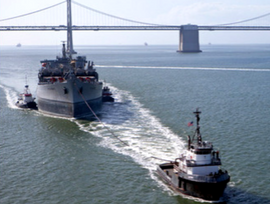 This marine transportation powerhouse has depended on the reliability of its tugboats on jobs that range from traversing the waters off Long Beach, Calif., to hauling cargo through the Pacific Ocean to Hawaii. Back in 2003, after having trouble finding engines capable of sustaining the heavy operational hours of their workboats, Sause Bros. chose MTU marine diesel engines from Pacific Power Group for the first time. After more than 13 years of tugging and 32,000 hours of operation, the original tug is still going strong and other workboats in their fleet are getting a similar repower with durable MTU engines. With West Coast and Hawaiian trips ranging from 900-2400 nautical miles, engine reliability is paramount. The MTU engines used on board Sause Bros. tugboats are trusted for their ease-of-operation, reduced operating noise and throttle responsiveness that have made piloting easy on tug and tow jobs. Crews on board Sause’s MTU-equipped workboats find that the extended time before overhaul and the simplified MTU overhaul process have made engine maintena nce a breeze which is critical when the workboats operate for as many as 6,000 hours per year. After 13 years of reliable propulsion, PPG has provided nine tugboats with MTU engines as part of Sause’s Bros. plan to integrate MTU into their entire workboat fleet. “Because of its reliability and quality, we have no problem recommending MTU to anyone in our industry,” said Dale Sause.